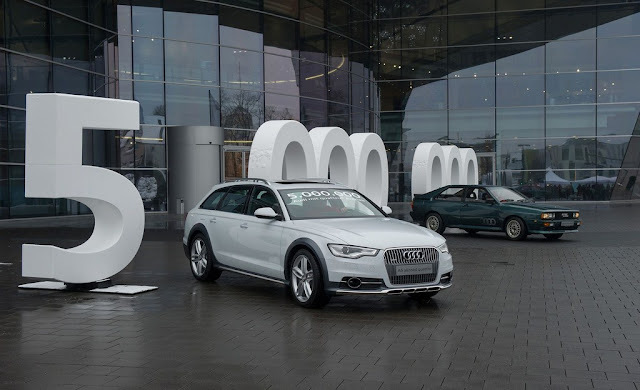 Audi recently celebrated the five millionth Audi with the quattro system. It was a white Audi A6 allroad 3.0 litre TDI and rolled out of Audi’s Neckarsulm plant, Germany, it said in a press release. Quattro debuted in 1980 and has since progressed to encompass several systems. In the A3, Q3 and TT, power is biased to the front wheels but is capable of diverting almost all the engine’s power to the rear. Most models, on the other hand, put 60 percent of the engine’s torque to the rear wheels by default while torque is distributed between the wheels to maximize traction. Finally, the RS4 and RS5 use a version that can direct up 85 percent of the torque to the front wheels, or up to 70 percent to the rear. The special Audi character takes on an exclusive form in the models offered by quattro GmbH, a subsidiary of AUDI AG responsible for developing and building Audi’s high-performance RS and R8 models. The customer can have his car customized by the company and order special accessories. Demand for this is increasing:the 800 employees of quattro GmbH represent dynamic growth over the company’s 30 years of existence.